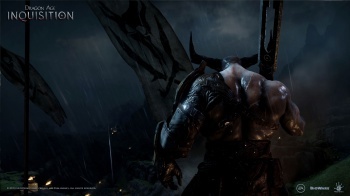 Dragon Age Inquisition will know what you did in the earlier games - one way or another - and those decisions will matter. You still have your old save files from Dragon Age: Origins, right? If so, you can look forward to seeing a few nods to the Grey Warden's actions in the upcoming third entry to the series, Dragon Age Inquisition. Like the Mass Effect series, Dragon Age changes based on your decisions in previous games, though some have wondered if that will be possible when Inquisition moves on to the next generation of consoles. The answer from BioWare is a firm "yes" - but nobody's willing to say more just yet. A fan at PAX Australia asked BioWare producer Cameron Lee how the game would handle choices that players made on current-gen consoles. "We know what we want to do," Cameron answered. "It will absolutely come across - your decisions carry [and] will matter." These types of save importing systems have always been tricky when dealing with players starting the series in the middle, or moving to a new platform between games. BioWare acknowledges this concern, and even though all lips are sealed at the moment, there appears to be a plan. "The goal is that you can have an equally rich experience no matter which platform you're playing on," says writer Patrick Weekes. This could mean a direct save import, or a multiple-choice history lesson like we saw in Mass Effect 2's opening. Either way, BioWare is aware of its fans' high expectations, and seems to be doing its best to deliver.